About Stevens Worldwide Van Lines Stevens Worldwide Van Lines is The Way to Move ... and is a leader in the moving and storage industry, with agents across the country and around the world. Stevens has the ability to handle household goods moves, office moves and specialty moving services. Stevens has special divisions for corporate moving services, affinity moving services and clergy and church denomination moves. Stevens also has a dedicated division for military and government moving. Stevens Worldwide Van Lines was established in 1905 in Saginaw, Michigan. Founder Frederick H. Stevens, Jr. used a single horse and dray to haul baggage to and from the Michigan Central Passenger Depot. Stevens is now a full-service moving company with nearly 150 agent locations throughout the United States and has a division specifically dedicated to international relocations. 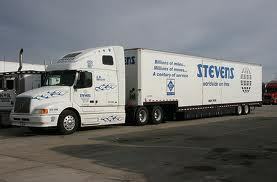 Stevens performs local moves, long-distance moves and international moves with storage options for all types of moves. Stevens also has special services for records storage and records management at many of its locations. Stevens Van Lines has continued under leadership of the same family for its entire history, and still maintains its headquarters in Saginaw. Members of the fourth and fifth generations of the company founder continue to hold executive positions in the van line. Stevens is ISO 9001 quality certified. This certification means that we adhere to a set of internationally recognized guidelines for excellence and continuous improvement. The Stevens International division is a member of FIDI/FAIM, the International Association of Movers and the Latin American & Caribbean Movers Association. It also holds the ISO 9001 certification, and licensure from both the Federal Maritime Commission and the International Air Transport Association. Stevens is recognized as a ProMover by the American Moving & Storage Association. The ProMover program promotes ethical principles in the moving and storage industry and works with federal and state governments to eliminate unethical moving practices. ProMover clearly separates professional movers from rogue operators posing as legitimate movers. To qualify as a ProMover, movers must pass a rigorous review of professional business standards. Stevens has an Employee Stock Ownership Plan (ESOP), with Morrison Stevens, Sr., President and Chief Executive Officer, owning 70% of the company and employees owning the remaining 30%. Because of their ownership, employees in ESOP companies tend to have more dedication to their work and are more dedicated to quality and customer satisfaction than employees who do not have a ownership interest in their employer. Stevens’ Mission Stevens is the leader in the relocation industry and sets the standards for service, quality, value and customer commitment as well as investment and support of its employees and partners. Stevens' Quality Policy The Stevens Group will deliver Total Customer Satisfaction at a value that meets customer agreed-upon terms and conditions. Stevens is The Way to Move through our commitment to be the industry leader in providing quality driven consumer and corporate relocation services with quantifiable results.